These days, it’s a rare experience to visit a website without a homepage slider full of images, information, products, and blog post previews. There’s no doubt the slider is a popular component of web design but is it effective? And when should it be used? Smashing Magazine suggests that a slideshow is an interactive way to display information in an organized and compact way. They say that sliders are wonderful to use on portfolio websites. That’s good news for realtors because when you run a property listing website, your website is basically one large portfolio of homes. And the best way to showcase homes is through images. 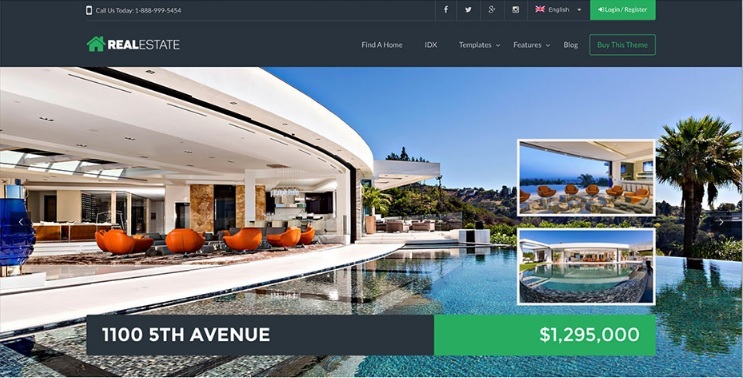 Here are 4 ways you can use image slideshows on your property listing website in order to enhance the perception of your properties. You can create a list of all the amazing features a home has, but text-based descriptions can never replace the impact of beautiful images. When you’re selling homes, buyers want to see everything they can before they come out to look at the property in person. The more you can paint the picture, the more likely your visitors will come out for a showing. That doesn’t mean you should stuff a slider with as many images as possible. It means being selective and choosing the best photos that are most likely to increase the perception of the property. As a rule of thumb, if you have an image that doesn’t add to the perceived value of the property, don’t post it. Even if it’s a photo of a main room in the house, if it doesn’t look good it might deter people’s interest. Nothing frustrates visitors more than being unable to control a slideshow that speeds through images. If you’re selling houses, your visitors will probably want to be able to pause the slideshow or flip through it at their own pace so they can look at each image. Or better yet, instead of automating your slideshow, you can give visitors full control, like this Greenville, NC website. Their slideshow doesn’t move automatically, and visitors can click the arrow whenever they’re ready to move to the next slide. People are hard-wired to respond to visuals, and that’s why the world of marketing relies heavily on visual marketing. It’s the reason Instagram is such a popular social media platform, and why memes can make their way around the internet for decades and never get old. So it stands to reason that the photos of your properties are going to be your biggest marketing asset. But let’s face it – if you’re a realtor, you’re probably not a professional photographer as well. This means you may not know how to capture the beauty of a home when the lighting is less than optimal. No smartphone in the world can take a perfect picture under every lighting condition. Since many rooms in a home can be dark with no overhead lighting, photos taken in poor lighting can make the property look bad. And if you don’t understand how to work around angles, keep yourself out of mirrors, and work the flash, your photos won’t help sell the house. You can see several examples here that demonstrate the difference between using a point and shoot camera and professional photography. Not staging the scene first. Nothing can deter people more than seeing photos of a messy room, a bathroom counter full of toiletries, or even an open toilet lid. Make sure you stage the scene before taking any photos. And be careful where you place the focal point of your images with staged furniture. You don’t want to focus on the furniture and give the impression that the furniture is being sold with the house. Poor exterior shots. The angle of your external photos can make the home look small if you’re too far away, or if you’re capturing part of the neighbor’s house in the photo. Taking photos from the side is actually one of the best angles to capture the true size of the house. Using awkward angles. The lens of a camera only captures about 6-10 feet of a room, so depending on where you stand when you take the photo, you could be cutting off the true depth of the room, making it appear much smaller than it really is. Capturing three walls in the photo using a wide angle lens is the best way to show the depth of the room. While it’s always a good idea to stay up to date with information on marketing, make sure the information is relevant to your industry. There is a raging debate within the internet marketing world regarding the use of sliders. And while it’s pretty well established that image slideshows don’t always work well for selling products, they are essential when you’re painting the picture for an experience – like property listing websites.